Mill Valley took a giant step forward with its new plan for Miller Avenue, one of two arteries through town. It’s not perfect, of course, but it will emphasize bus and bicycle access. Hopefully the city will work with Golden Gate Transit to improve travel times and headways, too. Want to join a planning board? TAM and Fairfax are both looking for citizen volunteers. Two amazing things, parks and beer, are coming together. Lagunitas Brewing Company is looking to operate and maintain Samuel P. Taylor State Park, which is threatened with closure due to state budget cuts. Napa County will receive some CalTrans money to study traffic flow for Highway 29, which runs from the city of Napa to American Canyon. San Francisco’s cable car fleet has entered the digital age, as they now accept Clipper Cards for payment. Won’t make them any cheaper, though. Also in The City, Muni is trying to speed its abysmally slow transit fleet through all-door boarding, letting people pay at the back or front or middle of the vehicle. California’s High-speed rail will be more expensive thanks to changes sought by Central Valley communities, including a 42-mile stretch of elevated rail, leading lawmakers to question whether the state can afford the project. CA HSR Blog fires back at the criticism, saying, “If we want to build high speed rail and provide the basis of sustainable 21st century prosperity, we need to figure out how to get this built, and not make excuses for doing nothing.” They also have a list of the new documents that detail the added costs. The Central Valley is known for its Midwestern flair for sprawling communities, and UC Berkeley examined why in a working paper examined by Half-Mile Circles. Its conclusion? Despite a desire for high-end transit, “Unless considerably higher densities are embraced and politically accepted, high-end transit services will remain a pipedream in settings like Stockton.” Reminds me of a streetcar project a few years back. Lastly, we have a good example of how a building’s perceived size can be altered substatially by modifications to the façade. DCMud, Washington, DC’s local real-estate blog, looked at an impending project in the popular and developing 14th Street Corridor. The local community thought the original design was too over-bearing on local streets of rowhouses, so developer Eric Colbert reworked the design and, without losing much square footage, created a very different building. San Anselmo serves as a good example of good and bad crosswalk planning. There are certain stretches where crosswalks are commonplace, mostly along San Anselmo Avenue downtown and Sir Francis Drake from Tamal Avenue to Fairfax. Outside of these areas, walkability seems to be an afterthought, especially along Redhill and Center, where crosswalks can be almost half a mile apart. The map at right shows the disconnect. I’ve highlighted all crosswalks over or next to arterial roads in red. The longest stretch without a crosswalk is on Center, where two crossings are nearly a half-mile apart from one another. A sidewalk ends without a crossing, and cars tend to speed along that stretch of road. On Redhill, there’s a commercial strip in the median that has no crosswalks except at the beginning and end. For the 18 years I lived on Forbes, which forms a T intersection with that strip, I only saw a parade of rotating businesses occupying the buildings. Especially within a half-mile of the Hub, San Anselmo’s principal bus terminal, pedestrian traffic should be encouraged as much as possible. With its arterials forming barriers, businesses become isolated from one another, diminishing the appeal of downtown as a destination, and businesses cannot easily draw from its own population base. San Anselmo, Fairfax and Ross should do a pedestrian traffic survey, identifying areas of possible improvement. I suspect that adding crosswalks and calming traffic would be among the recommendations. San Anselmo has the potential to become a walkable town with vibrant streetlife in its core and a healthy, walking population, but it needs to invest in the infrastructure to make it happen. SMART works well as a Marin-Sonoma train, but it has a lot of shortcomings, too. Once it’s up and running, it needs to look beyond Cloverdale-Larkspur. It’s 2030, and SMART is a smashing success. Despite the best efforts of rail opponents throughout the construction of both Phase One and Phase Two, SMART has far surpassed ridership expectations and is the backbone of Marin and Sonoma’s transportation systems. That, at least, is what I hope I’ll get to write about in my late 40s. Despite its flaws, and they are manifold, SMART is a good project. This is especially true for the commuters from Sonoma to Marin who constitute 39% of Sonoma’s commuting workforce. Yet for Marinites, SMART is only a partial solution. Far more Marin commuters work in San Francisco than in Sonoma, and this will be just as true when SMART is fully built as it is now. So how might SMART expand to serve areas outside Marin? Here are a few of the options I’ve seen floated around. Run BART along SMART tracks, or vice versa. This plan sounds good, but it is technically impossible. BART runs on a different track width than SMART – Indian Gauge for BART, Standard Gauge for SMART. BART tracks would need to be constructed from scratch along 101, and SMART could not operate on them. If people are complaining how expensive SMART is, they’d surely balk at a project with more than 10 times the cost. Back of the envelope cost: $500 million/mile, or $6-35 billion, depending on how far north BART goes. Run SMART across the Golden Gate Bridge to the Transbay Terminal. 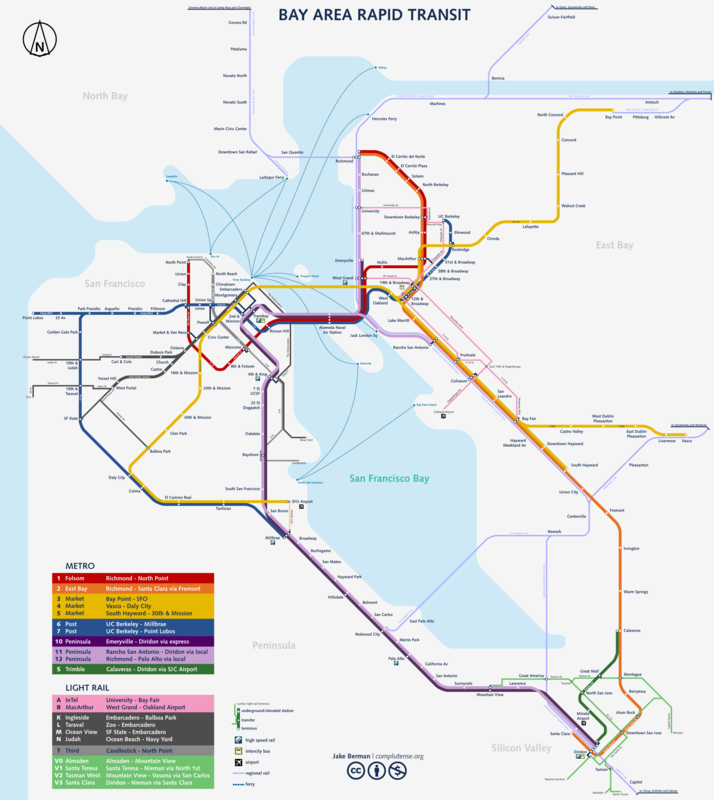 This plan would be a partial resurrection of the original BART plan, which called for the train system to run north to Ignacio. In its place, SMART would have to reconstruct tracks south of Larkspur, reconfigure the bottom deck of the Golden Gate Bridge, and build new tracks out from the Bridge. Once the system reached San Francisco, the system would get far trickier and far more expensive. SMART’s trains couldn’t run on the streetcar tracks along the Embarcadero for a number of reasons, such as incompatible stations and the safety of mixing streetcars and regular trains, so new tracks would need to be built through a dense, urban area already well-served by transit. In total, 16.5 miles of new track would need to be reconstructed or built. Back of the envelope cost: $8 billion+. All these plans have some heavy drawbacks. The isolation that makes Marin so fantastic hampers exercises such as this. So is there a way to improve connectivity without doing something with such high barriers? To some degree, yes. As it currently stands, the Larkspur SMART station will be built 0.4 miles away from the Terminal, forcing a 15 minute walk through extremely pedestrian-unfriendly territory: a bus depot, two parking lots, a barren pedestrian bridge over an overbuilt Sir Francis Drake Boulevard, and another parking lot. This makes the total trip from SMART to San Francisco at least 55 minutes long – the maximum most people are willing to travel. Improving the space between the SMART station and the Ferry to be more pedestrian-friendly would ease the walk, and operating a shuttle would cut down on walking time. There are no good, inexpensive ways to utilize SMART outside of its already described corridors unless Marin is willing to foot a much, much larger bill. Given the opposition SMART has received already, I cannot imagine support building for a further expansion without a major shift in thinking about transit in the County.